Treated as "second-class citizens" by their national federation, with no matches or head coach for seven months, members of Colombia's women's team have begun to speak up. Stars from the men's side, including Radamel Falcao and James Rodriguez, have now joined those voicing their support for their female counterparts, after allegations of sexual harassment within the girls' under-17s setup came to light following complaints of sexual discrimination at senior level. Forward Melissa Ortiz says Colombia's Football Federation treat the women's squad "with no respect", making players pay for their own travel, after twice going more than a year without a training camp. 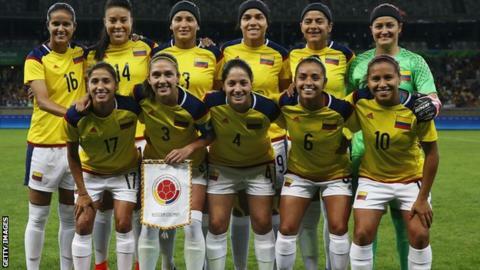 Ranked 26th in the world, Colombia's women have not played an international fixture since last July. But even if fans cannot see them play, governments and unions are now watching their situation closely. In a statement, the Colombia Football Federation [FCF] said no players had reported concerns of discrimination to them formally, adding: "Women's football is a priority for the executive committee. "We are working hard with the intention of being host to the Women's World Cup in 2023. We reiterate to our players that the Colombian Football Federation is their home." Ortiz and her team-mate Isabella Echeverri have accused the FCF of sexual discrimination, saying they receive far inferior treatment compared to their male counterparts. "I demand they respect and value us, not only as people, but as footballers. It doesn't matter whether we're male or female," Ortiz told BBC Sport. "They're treating us like second-class citizens and not giving us the respect we deserve. They have a 'machista' mindset." In a joint statement, senior members of Colombia's men's team, including Falcao, Juan Cuadrado and Rodriguez, posted on social media to call for "prompt and vigilant" investigations. They added: "We support our companions, of the Colombian women's team. Women's soccer must continue to grow and develop, and for that the players will always have all our support." A spokesperson for world players' union FIFPro told BBC Sport: "We fully support moves by women footballers in Colombia, and across South America, to highlight the vastly inferior conditions received by women's national teams. "Football federations have a duty to provide comparable treatment to men and women's national football teams; they should not exclude or marginalize women players." In Argentina, striker Macarena Sanchez is suing her governing body because she believes they do not support the women's game. Colombia finished fourth in 2018's Women's Copa America, after reaching the final of the 2015 Pan American Games and reaching the knockout stages of the 2015 Women's World Cup. Ortiz says since the team missed out on qualification for this summer's World Cup in France and 2020's Olympics, the situation with the FCF has got worse. "I have, in the past, paid for my own flights, as well as many other players who live outside of the country, and it's cost thousands of dollars each, because any person would dream of playing for their national team," she added. "Also, after the Rio Olympics, we went over 400 days without a coach and without one training session or camp. That was detrimental. "Similarly, after 2012 London Olympics we went 745 days without any training or a coach. We have to speak up about this." Florida-born former Boston Breakers player Ortiz, 29, lives in the United States but qualified to play for 'La Tricolor' because both of her parents are Colombian. Asked why she had not spoken up previously, she replied: "That was out of fear that we would be cut from the team. Nobody wanted to fight it because of the risk to their future career. "I never said anything, because it's your dream to play for the national team, but at this point, we don't really have anything to lose. "Now, we know the consequences, but we're fighting a battle to help women's football, demanding respect and support." Since Ortiz and Echeverri raised their concerns publically, separate allegations of sexual harassment within the under-17s national squad have come to light. The FCF has faced criticism for its response to the allegations, including from members of the country's government. Carlos Alfonso Negret Mosquera, the Colombian government's minister for protecting human rights, has written to Fifa's ethics committee to highlight his concerns, as well as writing to the president of the FCF. He expresses surprise at FCF's response and apparent attitude towards the allegations of sexual discrimination from Ortiz and Echeverri, and requests that the FCF bring in grievance procedures. "In my context as ombudsman, I would like to express my concern regarding the complaints that have been filed," Mosquera writes. "In Colombian sport, any barrier that prevents the materialization of gender equality will be eliminated." A statement from the FCF added: "We ask the Attorney General's office to clarify as soon as possible the reported acts of alleged sexual abuse, for the welfare of our players and members of the Colombia Under-17 national team. "We categorically reject sexual harassment, and we declare zero tolerance for acts that in any way threaten the integrity of any member of our [squads]. For this reason, we will cooperate with the Attorney General's office in any process that they require." A statement from Fifa said: "FIFA and CONMEBOL have strongly condemned all forms of sexual abuse, harassment at work, gender-based violence and/or violation of women's or children's rights and, following a request by the FCF, have offered their full assistance and the expertise of their competent bodies to the FCF in order to help prevent, and where needed to sanction such violations."